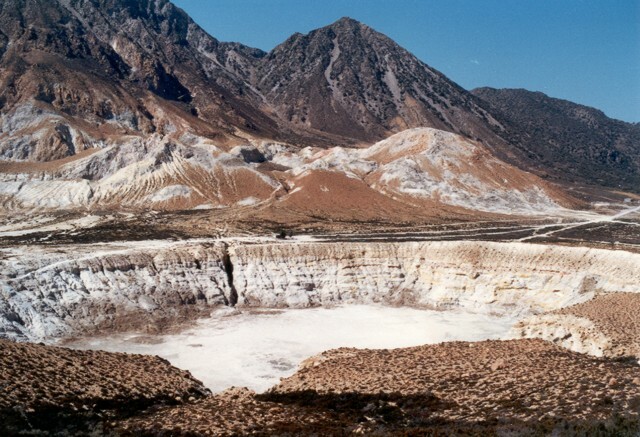 According to a news article, the crater of Nisyros was declared off limits to visitors, due to increasing temperatures and growing surface cracks. Evangelos Layios, the director of Athens University's geophysics laboratory, stated, ". . . earthquakes in 1995-96 triggered changes in the general condition of the volcano. For example, the hydrothermal system has increased in [temperature] from 210 to 315 degrees Celsius, there is continuous microseismic activity as well as changes on the surface of the ground." The ban on visitors was prompted by a crack on the volcano that almost tripled in length over the past year to 139 m.
The Global Volcanism Program has no Bulletin Reports available for Nisyros. The easternmost volcano of the Aegean arc forms the 9-km-wide island of Nisyros, which is truncated by a 3-4 km wide caldera. The island was constructed during the past 150,000 years, with three cone-building stages including explosive and effusive andesitic eruptions and effusive and extrusive dacitic and rhyolitic activity. The age of the caldera is variously considered to be <24,000 years before present (BP) (Keller et al., 1990) and >44,000 BP (Limburg and Varekamp, 1991). Five large post-caldera lava domes completely fill the western part of the caldera. The NE-most (Boriatiko) and SW-most (Karaviotis) lava domes and flows are significantly younger than the other domes. A sixth post-caldera dome, outside the SW caldera rim, produced lava flows that reached the coast. Historical phreatic eruptions occurred from craters within the caldera between 1422 and 1888. Intense hydrothermal activity continues in the form of many fumaroles on the caldera floor and hot springs along the coast. Brombach T, Caliro S, Chiodini G, Fiebig J, Hunziker J C, Raco B, 2003. Geochemical evidence for mixing of magmatic fluids with seawater, Nisyros hydrothermal system, Greece. Bull Volcanol, 65: 505-516. Caliro S, Chiodini G, Galluzzo D, Granieri D, La Rocca M, Saccorotti G, Ventura G, 2005. Recent study of Nisyros volcano (Greece) inferred from structural, geochemical and seismological data. Bull Volcanol, 67: 358-369. Francalanci L, Varekamp J C, Vougioukalakis G, Defant M J, Innocenti F, Manetti P, 1995. Crystal retention, fractionation and crustal assimilation in a convecting magma chamber, Nisyros volcano, Greece. Bull Volcanol, 56: 601-620. Lagios E, Sakkas V, Parcharidis I, Dietrich V, 2005. Ground deformation of Nisyros volcano (Greece) for the period 1995-2002: results from DInSAR and DGPS observations. Bull Volcanol, 68: 201-214. Limburg E M, Varekamp J C, 1991. Young pumice deposits on Nisyros, Greece. Bull Volcanol, 54: 68-77. Sachpazi M, Kontoes C, Voulgaris N, Laigle M, Vougioukalakis G, Sikioti O, Stavrakakis G, Baskoutas J, Kalogeras J, Lepine J C, 2002. Seismological and SAR signature of unrest at Nisyros caldera, Greece. J. Volcanol. Geotherm. Res., 116: 19-33. Tibaldi A, Pasquare F A, Papanikolaou D, Nomikou P, 2008. Discovery of a huge sector collapse at the Nisyros volcano, Greece, by on-land and offshore geological-structure data. J. Volcanol. Geotherm. Res., 177: 485-499. Reference List: Lagios et al. 2005; Sykioti et al. 2003; Sachpazi et al. 2002. Lagios, E., Sakkas, V., Parcharidis, I., & Dietrich, V., 2005. Ground deformation of Nisyros Volcano (Greece) for the period 1995-2002: Results from DInSAR and DGPS observations. Bulletin of Volcanology, 68(2), 201-214. Sachpazi, M., Kontoes, C., Voulgaris, N., Laigle, M., Vougioukalakis, G., Sikioti, O., Stavrakakis, G., Baskoutas, J., Kalogeras, J. and Lepine, J.C.,, 2002. Seismological and SAR signature of unrest at Nisyros caldera, Greece. J. Volcanol. Geotherm. Res., 116: 19-33. Sykioti, O., Kontoes, C. C., Elias, P., Briole, P., Sachpazi, M., Paradissis, D., & Kotsis, I., 2003. Ground deformation at Nisyros volcano (Greece) detected by ERS-2 SAR differential interferometry. International Journal of Remote Sensing, 24(1), 183-188. Remarks: Uplift from 1995 to 1998 is coincident with intense seismic activity. Interferograms calculated by the phase di?erence of SAR images recorded by ERS satellite for the period from June 4, 1995 to June 8, 1997. A continuous surface movement with an approximately circular shape is observed with its center to the NW coast of the island. (a) Three fringes are shown for the period of June 4, 1995 to May 19, 1996, indicating a ground defor- mation in slant range direction of the order of 84 mm. (b) Two fringes are shown for the period of May 19, 1996 to June 8, 1997, indicating a further surface displacement of 56 mm. (c) Five fringes of 140 mm occurred in the period 1995^1997. From: Sachpazi et al. 2002. There is no Emissions History data available for Nisyros. The ash cone and crater in the foreground were formed during an eruption on the caldera floor in 1871. Phreatic explosions ejected ash and lapilli that covered the caldera floor, destroying fruit gardens. Five explosion craters pocket the 800 x 1400 m wide caldera floor. Post-caldera lava domes form the horizon. Mount Hagi Ilias lava dome occupies the western side of a 3-4 km wide caldera at the summit of Nisyros volcano, the easternmost of the Aegean arc. The age of the caldera is variously considered to be <24,000 years before present (BP) and >44,000 years BP. 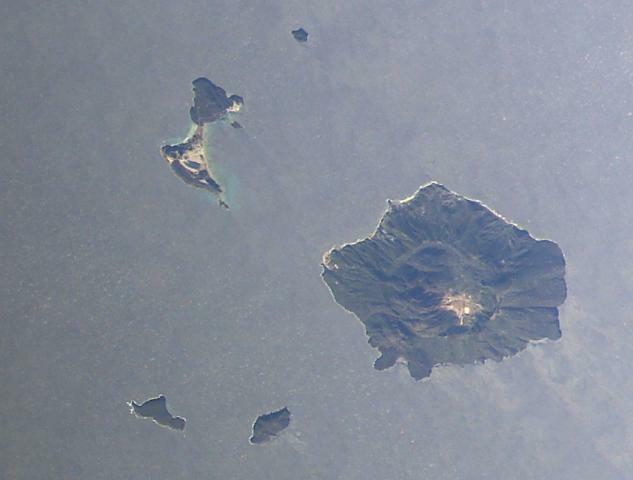 Five large post-caldera lava domes completely fill the western part of the caldera. Historical phreatic eruptions occurred within the caldera between 1422 and 1888. There are no samples for Nisyros in the Smithsonian's NMNH Department of Mineral Sciences Rock and Ore collection. Large Eruptions of Nisyros Information about large Quaternary eruptions (VEI >= 4) is cataloged in the Large Magnitude Explosive Volcanic Eruptions (LaMEVE) database of the Volcano Global Risk Identification and Analysis Project (VOGRIPA).